Abraham LeFevre, the eldest son of Isaac LeFevre and Catherine Ferree, was born in Bavaria and about two years old when his family arrived in America. Isaac and Catherine had six children: four sons, Abraham, Philip, Daniel, & Samuel and two daughters, Mary & Esther. He provided a tract of land for each of his sons. Abraham's tract containing 318 acres was located a little north of Strasburg and about two miles west of the land Isaac received when the original Ferree land grant was divided among family members. The price paid for Abraham's tract was thirty English pounds. Abraham and Isaac were building a two story log house on the land when Abraham died in 1735 at the age of 29. The house was completed by Isaac. 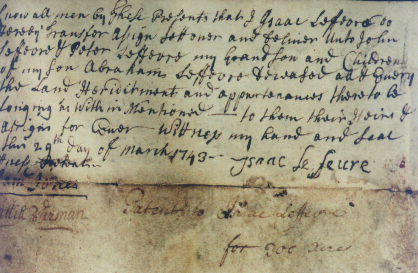 Below is the record dated March 29, 1743, showing the transfer of this land by Isaac to Abraham's two sons, John and Peter. John received the southern half and Peter the northern half. This was written on the back of the original sheepskin warrant Daniel Ferree and Isaac LeFevre received from William Penn. 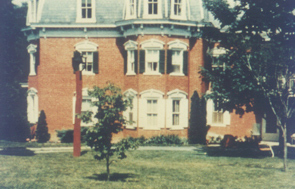 This house which contains 27 rooms was built on John's half of the 318 acre tract on the south side of North Star Road. It was built by John's youngest son, George, in 1836 and later became the home of George Newton LeFevre, author of "The Pennsylvania LeFevres"
The far end of this house was built in 1797 by Peter on his half of the tract. 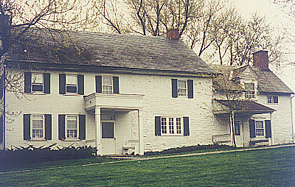 The large brick addition was built by Peter Jr. in 1821. Peter Jr. was a doctor and had an office in a small stone building behind the house. That was torn down in 1970. This house is located on Herr Road about a half mile north of the George Newton LeFevre home. It is now known as "The Old Homestead Farm and Greenhouse"
Abraham LeFevre was born April 9, 1706 and died November 20, 1735. Married Elizabeth Ferree. John LeFevre was born June 21, 1730 and died October 18, 1810. Married Margaret Henning. Peter LeFevre was born January 5, 1732 and died January 12, 1799. Married Catherine LeFevre. Lineage: Abraham LeFevre and Elizabeth Ferree/Catherine Ferree and Isaac LeFevre/ Daniel Ferree and Marie Warenbur. Sources: "Lefevre Historical Spots" by Art Glenn www.artglenn.com/family/Lefevre; "The Pennsylvania LeFevres" by George Newton LeFevre, www.pennsylvanialefevres.org/book/records; "Paradise Our Heritage Our Home" edited by Robert Denlinger.